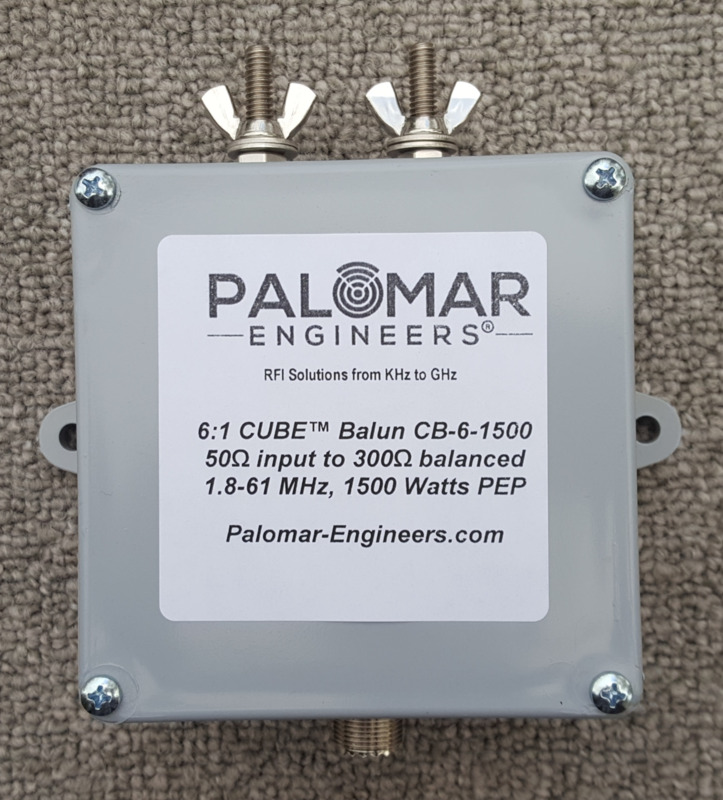 Model CB-6-1500/3000 is a 6:1 (300:50) balun housed in a NEMA enclosure box (1.5KW in 4″ x 4″ x 2″, 3KW in 6" x 6" x 4") with two top studs capable of input power levels up to 1.5KW PEP watts when used with a matched load. The 6:1 ratio takes 50 ohms input and matches to 300 ohms balanced output from 1-61 MHz with SWR < 1.5:1 under matched load conditions. A great balun for windoms, OCF antennas >60 feet over ground, Hertz and folded dipole antennas, T2FD etc. 8 core, Use “EB” version with side eye bolts for wire attachments for OCF dipole use.